The 45-year-old radio journalist of Arangkada 153 in dzME named Marlina “Len” Flores-Sumera was reported to have been killed through a gunshot while on her way to work. Police authorities reported that an unidentified gunman clutched his firearms causing the bullet to hit right through the back of Sumera’s head. The incident happened in Malabon City, Philippines on a Thursday morning. The bullet headed on the nape of the Filipina journalist according to the Public Information Chief Superintendent Rio Gatacillo of Northern Police District. Gatacillo claimed that the lone gunman who shot Sumera was an expert killer hired with a deep purpose of killing. The crime scene was seemingly planned. The police official was sure of his description on the (–foul word(s) removed–)(–foul word(s) removed–)in after they found out that even the empty slug of the killer’s firearm was nowhere to be found. Authorities speculated that the killer might have left carrying the pistol’s empty slug. Along with him was Sumera’s cellular phone and hand bag seemingly intended to be taken to confuse investigators on the suspect’s real motive. She was rushed to Valenzuela General Hospital but medical officials declared the victim as dead on arrival. 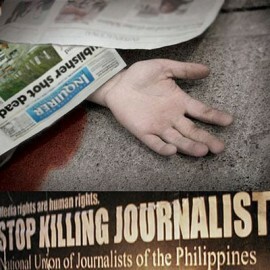 This has been the fourth case that a journalist had been slain since President Benigno Aquino III took his term. After analysing the scene of the crime, police also found out that there had been a man and a woman who served as lookouts while riding on a motorcycle that could have (–foul word(s) removed–)isted the main suspect. While Sumera was still leaving her home, the (–foul word(s) removed–)ailant have already been watching her actions until the suspect was able to grab an opportunity to fire a gun on the victim’s head. After the (–foul word(s) removed–)(–foul word(s) removed–)ination, the lone gunman directly left the place through a jeepney while the two lookouts rushed with their motorcycle. Gatacillo stated that sketches of the suspects will be released as soon as possible after two witnesses came to testify about the incident.